Unlocking the food label is the key to discovering what’s actually “hiding” in the foods that you eat. But sometimes it can feel like you need a degree in nutrition or food science to decode all the claims and numbers listed on the package. 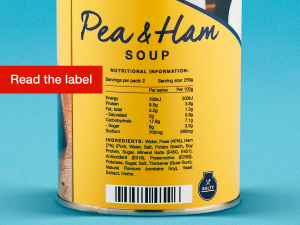 That’s why Unpack The Salt has put together some simple tips on how to read a food label and how to understand the information these labels contain. Almost all food packages in Australia are required to have a NIP (unless the packet is very small or doesn’t need one, this applies to products like water, tea, herbs and spices). Government set standards outline the details that are required to be included on the NIP, so you can be sure that the information is reliable. When you are reading the NIP, it’s important to remember that salt is listed as SODIUM. This is because salt is made up of sodium and chloride, and it’s the sodium part that can be damaging to your health. When you are comparing two similar products (like two pasta sauces), you need to look at the per 100g column. Once you have read this information, all you need to do is pick the product that has less sodium. If you are looking at just one product on its own, rather than comparing foods, choose a product that has less than 120mg of sodium per 100g; these foods are considered ‘low salt’. The next best options have less than 400mg of sodium per 100g. Anything over around 600mg of sodium per 100g is quite salty, so you might want to look for a healthier alternative. The other column in the NIP is ‘per serve’; this will tell you how much sodium/salt is in one ‘serve’ of the food (how much you will be eating). Keep in mind that the food manufacturer decides what a ‘serve’ is, and sometimes they make this smaller than what you would eat so the numbers look more favourable. Looking at the ingredients list is another good place to find out how much salt is in the food. This list shows all the ingredients in the food, listed in descending order by weight (so ingredients at the top of the list make up most of the food). If salt or sodium is listed right at the top, you know it’s likely to be a pretty salty choice! If you need to make choices at a glance, you can also look out for salt claims on the front of the packet. ‘Low salt’ products are the best options as they have met specific criteria. ‘Salt reduced’ means the product has at least 25% less salt than a similar product (but it can still be quite high in salt). ‘No added salt’ means there has been no extra salt added to the product. This information might seem overwhelming to begin with, but once you start practicing, you will become a “salt spotting pro” in no time. We’ve also developed a handy label reading wallet card that you can take to the supermarket with you – download it here.